BUFFALO, N.Y. — The Robert Morris men’s hockey team (16-22-2, 11-15-2 AHA) was looking to pull off a huge upset on Friday afternoon at Harborcenter in downtown Buffalo as they took on the AIC Yellow Jackets (21-16-1, 18-9-1 AHA) in the first of two semifinals in the 2019 Atlantic Hockey Association Conference Tournament. 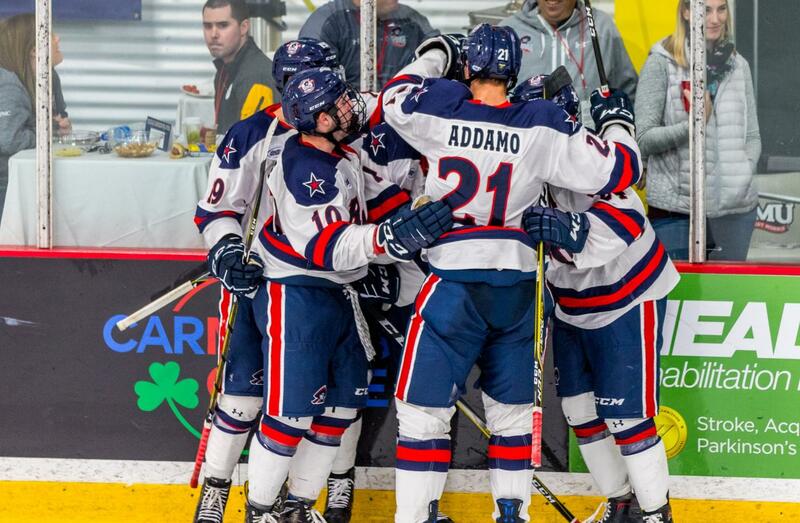 RMU was looking to propel themselves yet again into the championship, but to do so they would have to overcome a major obstacle in the form AIC, the no. 1 seed. The opening period started off strong for the Colonials as they came flying out of the gate and immediately put the physical play on the Jackets, hitting anything that moved. They had several early scoring chances, but were put down a man when Nick Prkusic was sent to the penalty box at 18:44 for hooking. RMU firmly established their penalty kill on the opening try and killed off the penalty, putting sticks in lanes and getting themselves in front of every shot AIC threw their way. The game remained stalemated until, after the Colonials got back into penalty trouble when Eric Israel was sent off for tripping at 10:12, the Yellow Jackets struck first. Jan Stefka scored his first career collegiate goal as he jammed a loose puck by Francis Marotte off a feed from Ryan Polin just as the penalty expired to give AIC the 1-0 lead. RMU got their own opportunity on the power-play just minutes later when Jeff Baum was called for slashing, but couldn’t generate any good opportunities and AIC killed the penalty off. It seemed given that RMU would go into the intermission trailing. But the tandem of Mike Louria and Alex Tonge struck as they have all season. Louria bounced a puck over to Tonge who backhanded it over Zackarias Skog to tie the game at one. With that, the teams headed off tied at one. Coming into the second period, the Colonials needed to have a strong defensive stand, but didn’t help their efforts when they let up the go-ahead goal just under four minutes into the middle frame. Chris Dodero worked the puck to Ryan Polin, who fed the puck over in the slot to Joel Kocur. At first, the play was ruled no goal as it appeared Marotte had reached back to keep the puck from going in. But after further review, officials deemed the puck completely crossed the line and AIC got the lead back, 2-1. The Colonials had another chance on the man advantage at 16:37 as the aforementioned Polin went to the sin bin for cross-checking and RMU was back on the power-play. However, RMU couldn’t capitalize and AIC returned to full strength. Then, Grant Hebert was nabbed for contact to the head at 13:29. 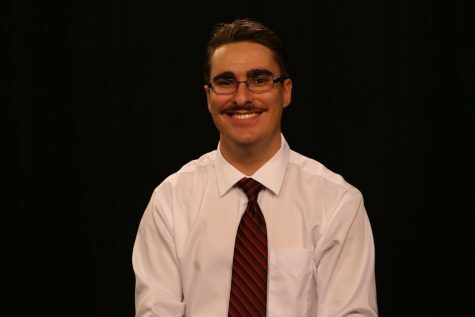 RMU killed the penalty off and was given another power-play when Hugo Reinhardt hauled down Eric Israel at 11:27, but couldn’t get the wheels turning, and even a glorious chance at the side of the net for captain Brandon Watt was fanned on and cleared. The Colonials also had several chances in tight in the final seconds, but Skog stayed strong and Marotte kept the attackers at bay. Nevertheless, RMU still trailed after two and would need a near-perfect third period to rally and come back. In the third, more of the same seemed to occur for the Colonials. They got several more chances on the power-play, but couldn’t find a game tier. Marotte was as solid as a brick wall, denying Yellow Jackets left and right, but still RMU pressed the net to no avail. With just over a minute left on the clock in their season, the line of Alex Tonge, Daniel Mantenuto, and Nick Prkusic showed just why Robert Morris are the cardiac and comeback kids. The puck was worked to Tonge, who fed it to Louria and then swung it in front. It came to Mantenuto, who wristed the puck past Skog to tie it at two in the last seconds, playing late-game hero similar to his game-winner at Bentley. With that, RMU skated to overtime against the top seed, their dream of heading to another title game still alive. To start overtime, the Colonials kept a couple of chances away, but their season ended in heartbreak just a minute and 44 seconds in as Shawn McBride fed leading AIC scorer Blake Christiansen who wrapped the puck around and through Marotte’s five-hole to give AIC the 3-2 victory. RMU head coach Derek Schooley, though admitting that the loss stung, did not hesitate to praise the fact that the Colonials pulled off an impressive feat just to get to the semifinals after many deemed the Colonials dead in the water during the early winter months. Daniel Mantenuto, who scored the game tying goal late in the third, also echoed his coach’s sentiments about his team’s will to keep believing throughout the game.